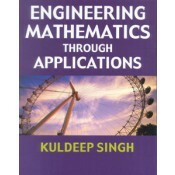 Engineering Mathematics through Applications is a new reference and self-study guide for professionals and students which uses applications from a wide range of technical disciplines to help teach the subject and convey its relevance. The mathematics is developed through clear and easy step-by-step examples rather than formal proofs, and the mathematical theory is supported by the use of technology in solving real life engineering problems. The answers to all the questions are included within, while complete worked solutions are available on the accompanying website. • Provides complete detailed solutions to carefully selected exercises that reinforce the text, making it ideal an ideal self-study guide. • Written in a chatty, user-friendly manner that will help motivate the reader. • For those who might need it, an optional introductory refresher chapter covering indices, fractions, decimals, percentages and ratios is offered. • Contains calculator and mathematical software examples and exercises.